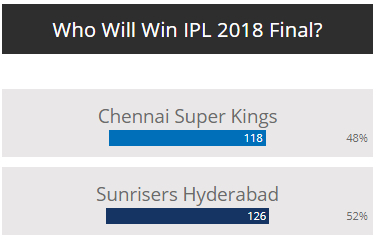 Home / Chennai Super Kings / IPL / IPL 11 / IPL 2018 / Sunrisers Hyderabad / Vote Now: Who Will Win IPL 2018 Final? Vote Now: Who Will Win IPL 2018 Final? After 59 matches and 49 days, Chennai Super Kings and Sunrisers Hyderabad have made to the final of the 11th season of Indian Premier League – IPL 2018. Chennai Super Kings and Sunrisers Hyderabad will be playing in IPL 2018 Final on 27th May 2018 at Wankhede Stadium, Mumbai. Two-time IPL champions, Chennai Super Kings had made to the final after returning from two years ban; 2016 and 2017. Chennai Super Kings will be playing their 7th IPL Final of 9 participated seasons; CSK have qualified to playoffs in all the season they have played. This is the 6th IPL season for Sunrisers Hyderabad and will be playing their 2nd IPL Final after winning their first final in 2016. Chennai Super Kings have defeated Sunrisers Hyderabad thrice season, twice in the league stage and once in Qualifier 1 while Sunrisers Hyderabad is the IPL 2018 table topper. Who will be your favourite team in IPL 2018 Final; two time champions Chennai Super Kings or one-time champion Sunrisers Hyderabad.